On April 24, 1956, the cornerstone of the James Buchanan Duke Library was ceremoniously placed. 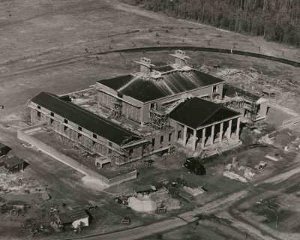 Although this structure was a pioneer on the new Furman University campus, the university library had more than a century of history and more than a hundred benefactors upon which to build. The South Carolina Baptist Convention established rules in 1826 to govern The Furman Academy and Theological Institution. The Board of Agents of the Convention was instructed to "take immediate measures for collecting a Library" and periodically, to enlarge the collection. The library was allotted 10% of the total expenditure for the fledgling institution. In 1830, there were 620 volumes, most of which had been donated by individuals or the defunct Roberts Academy, a private school for ministers. In the same year, the Convention also recommended the establishment of an archives for essential Furman Academy records and noteworthy documents of the Baptist denomination. Three years later, including the personal libraries of professors, the collection had more than doubled. The Furman Academy moved once after three years and relocated again before the decade ended. Each time the Academy moved (from Edgefield to High Hills of Santee to Winnsboro to downtown Greenville and finally, to its current site), the books were carried to their new location. In 1850, when the Convention decided to move The Furman Academy and Theological Institution to Greenville, it also acquired a new name, The Furman University. Unfortunately, the University did not have much time to enjoy its idyllic new setting and celebrate academic accomplishments. 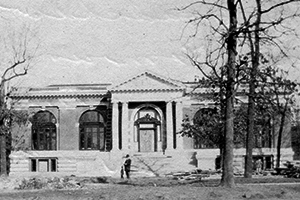 The Civil War erupted in 1861 and Furman and its library closed from 1862-1865. It took a generation for the University to recover from the impoverishment, destruction, and lack of support for liberal arts education. In the early years, there was one room in an academic building for library materials, but there was a brief period in which the library was located in a professor's home. By 1890, however, there was a Reading Room and a Library room in the main academic building, as well as independent libraries created by student societies. There was not a professional librarian responsible for the collection at this point, but a group of elected faculty members served as the Library Committee. This policy changed in 1902, when a Librarian was elected by the faculty. The first individual to be inducted was Nannie Louise Harrison, secretary to President E.M. Poteat. The construction of the first distinct library building was begun in 1906 and completed in the spring of 1907. Dr. E. M. Poteat, President of Furman University, submitted an appeal to Andrew Carnegie, a philanthropist with a penchant for library construction. Carnegie responded with $19,000 of the necessary $23,000 to construct the library, but he also required a permanent endowment. A number of individuals shared generously to cover the construction costs; Dr. C. H. Judson created the necessary endowment of $15,000. In the new Renaissance-style library, there was a General Delivery Room, a Reference Library Room, a Periodical Room, the beginnings of a card catalogue, room for 25,000 volumes and Miss Louise McIver McMaster, a professionally trained librarian. During the Depression, library funds were diverted to general University expenditures and acquisitions plummeted to an all-time low of 300 volumes. In 1936, Furman was successful in acquiring a Rockefeller Foundation Grant to purchase books and to pay the salary of an additional librarian. More than 7,000 volumes were added, bringing the total number of volumes to 32,500 at the end of the three-year grant. 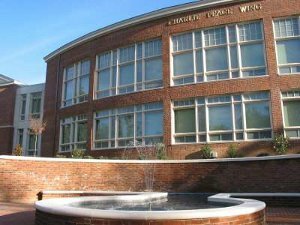 Less than a decade later, another grant was acquired to consolidate the Furman and Greenville Woman's College libraries. 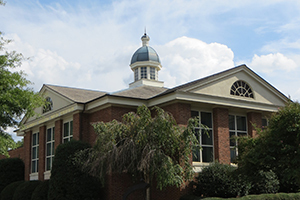 Although Furman and the Greenville Woman's College, and their respective libraries, would not be completely united until 1961, the 18,850 volumes held in 1955 in the Mary C. Judson Library of the Greenville Woman's College benefited students from both campuses. In 1946, the largest-ever freshmen class to date (due largely to the return of World War II veterans) crowded and cramped all facilities on the downtown campus. There were four professional librarians and three staff members valiantly struggling with the bibliographic needs of their expanded audience and collection. Dr. Robert C. Tucker became Furman's University Librarian in 1947. During his tenure, the library collection filled the Carnegie Library, a wartime barracks, a classroom, plus the Infirmary. Many of the preeminent South Carolina Baptist materials, which had been collected informally since 1830 and had become the Baptist Historical Collection in 1890, were forced into remaining space under a stairwell. Even with all these concerns, library employees still considered technological innovations. The Audio-Visual Department of the library offered several phonographs, including a portable one for Literature and Language classes, slide projectors, and a 16mm film projector which showed more than 120 films in one year. The inheritance Furman University received from Dr. Sidney Bradshaw in 1938 was the financial underpinning for a new library, and shortly thereafter, President John Plyler seriously contemplated replacing the Carnegie Library. The upheaval and repercussions caused by World War II postponed this decision until Furman moved from its downtown location. The eponymous designation of the library on the new campus recognized James B. Duke, founder of the Duke Endowment. Furman University has been a named beneficiary in this endowment from its inception in 1924, and the construction of the library was completed using $1 million from the Duke Endowment. The total cost of the library was $1.8 million and an optimistic use of space allowed for 300,000 volumes. In addition to recognizing James B. Duke, the wings on each side of the library recognized other significant donors. The Bradshaw Wing commemorated Dr. Bradshaw's bequest of his personal library and much of his estate to the new library fund. Dr. Sidney Bradshaw had been a Furman professor and administrator for more than thirty years. The Pitts Wing was named in honor of Dr. John Douglas Pitts, a prominent Baptist minister and Furman alumnus. His family established a $100,000 fund in his honor. In later years, the Bradshaw wing also contained the Bradshaw Room; the Pitts Room became the center for Special Collections and the Baptist Historical Collection established by H. T. Cook. As Furman settled into its new campus, students became increasingly aware of its isolation and lack of amenities. Most students did not have a car, there was very limited bus service, and there was not a student center until the mid-1960s. As a result, the library served as a gathering place, especially for women. Since freshmen women were only allowed in two places, their room or the library, from 7 p.m. until curfew at 11 p.m., many chose to visit the library. Recognizing this need, the library created a social lounge. The most recent expansion and renovation of the James B. Duke Library has also addressed communal needs with more numerous group study rooms and wide open areas in which students and faculty may congregate. The remaining years of the 1960s and the early 1970s highlight societal change. The University Librarian's annual report for June 1968 - May 1969 outlined the dramatic rise in the "unauthorized removals of materials" from the library and further commented on the "increasing deterioration of public morality." Although the social and political protests at Furman were not as virulent as those on other university campuses, there was discontent and unrest. The library continued its community-service role and on one occasion, its steps hosted an anti-war candlelight vigil. There was also change within the infrastructure of the library as the staff began to convert every one of the 155,000 volumes from the strictly numerical Dewey Decimal cataloguing system to the alphanumeric Library of Congress cataloguing system. At the end of the 1970s, library employees were still reclassifying volumes and had begun to investigate possible automation of library processes. The planning and research involved with electronic resources and automation of the library catalogue continued throughout the 1980s, as the collection continued to grow. Approximately, 10,000 books were added each year as well as issues of 1,500 periodicals. In 1985, the James B. Duke Library paid for access to Dialog, the first online research system for librarians. A few years later, the Library purchased Infotrac, a publicly available citation index to general magazines and periodicals. The 245 drawers of the card catalogue that were transferred from the downtown campus to the new campus had quadrupled and presented the last barrier to automation of library holdings. Two people were hired for the retrospective conversion of the collection and in November 1991, the telnet version of ALCUIN was introduced. ALCUIN was not only an acronym, Automated Library Catalogue and University Information Network, but also a scholarly link to the Furman mascot. In 1961, students voted to unify all athletic teams under the name Paladins. With faculty and Board approval, the purple knight on horseback, reminiscent of the peers of Charlemagne's court, took center stage. Alcuin was an important member of Charlemagne's court, serving as head of the palace school and librarian, an appropriate figure for a library's union catalogue. The librarians continued the theme and named each of the servers for the online system after historical figures from the Carolingian Renaissance. The library system did not become the nexus of the university information network as the acronym predicted, but by virtue of the public access terminals, it was the first "wired" building on campus. Library Director Dr. Ed Scott (1985-1995) initiated discussions pertaining to remodeling the James B. Duke Library. In the early 1990s, there were 50,000 volumes over the stated capacity of the library and twice as many students sitting in half the seating space of the original design. When Dr. Janis M. Bandelin became Library Director in 1996, the revitalization of the James B. Duke Library as well as the Music and Science Reading Rooms was a necessity. Initial plans for a music center began under Dr. Scott, and were expanded to encompass a fully operational music library and media center. The Robert J. Maxwell, Jr. Music Media Center and Library was dedicated in March 1998. Mr. Maxwell was a generous local philanthropist whose estate benefited thirteen local non-profit agencies, churches, and colleges. This branch of the Furman Libraries is managed by a full-time Music Librarian and multiple students. The Music Library's collection includes books, scores, compact discs, bound periodicals, DVD recordings, and access to online music encyclopedia and article databases. In 2004, under the management of Dr. Bandelin, the $25 million expansion and renovation of the James B. Duke Library was completed. The renovation includes the Charlie Peace wing, the funding for which was provided by Mr. Peace's daughter, Mary Peace Sterling, and the $9.5 million award from the Duke Endowment, which was applied in many ways. In 2008, during the refurbishment of Plyler Hall, the former Ezell Science Reading Room was expanded into the Science Library. It was named the Sanders Science Library in honor of Dan and Emilyn Childs Sanders during a dedication ceremony held on February 1, 2013. The Sanders are generous benefactors, volunteers, and philanthropists to Furman University and the greater Greenville Community. This branch of the Furman Libraries is managed by a full-time Science Librarian and multiple students. The Science Library's collection includes books, periodicals, and access to online resources such as Web of Science. Finally, even though the following observation was made nearly sixty years ago, its perspicacity still resonates. Frances Willard Simpson, University Librarian, mused in her 1945 annual report that although the library is filled with books, "books are after all only the physical embodiment of ideas." She further commented that statistics do not reveal the accomplishments of the library. Her conclusion was, "the ultimate effect of a library's contribution will appear in the lives of those who use it." South Carolina Baptist Convention Minutes 1826-1910; Furman University catalogues 1856-2003; The Bonhomie 1905-1975; William Joseph McGlothlin Baptist Beginnings in Education in South Carolina; Robert Norman Daniel Furman University: A History; Alfred S. Reid Furman University Towards a New Identity 1925-1975; Carnegie Library Annual Reports 1944-1956; James B. Duke Library Annual Reports 1956-2001; conversations with Steve Richardson, Betty Kelly, Nancy Sloan, Mary Fairbairn and John L. Plyler, Jr. Completed in the Spring of 1907, the Carnegie Library on the downtown campus of Furman University was built with funds from Andrew Carnegie. The cornerstone of the James B. Duke Library was placed in April 1956. The Library opened in September of 1958. 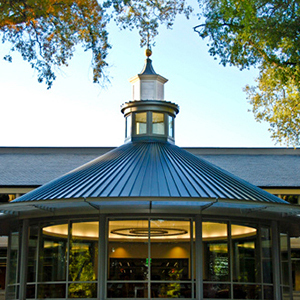 The Robert J. Maxwell, Jr. Music Media Center and Library is part of the Herring Music Pavilion and was dedicated in March of 1998. The $25 million expansion of the James B. Duke Library in 2004 included the addition of the Charlie Peace wing. The Sanders Science Library opened on Sept. 8, 2008 and was named in a dedication ceremony on Feb. 1, 2013.